In New Orleans, prior to 1930, camellias could not be grown satisfactorily. Only a few miles distant, to the east, north and west, however, they flourished with little or no care. This seemingly paradoxical situation set off many an inquiry into these beautiful plants cultural requirements. For camellias, that is to say, now flourish in New Orleans as well as they do anywhere else. 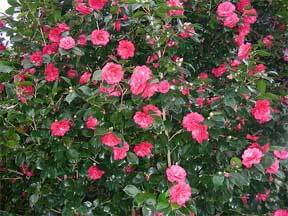 A lead to the solution of the problem was supplied by a camellia specialist in Alabama, who surmised that poor drainage and strong alkaline soils were contributing factors to the poor growth of camellias in New Orleans. Both his conjectures proved to be true. Areas to the east and north of New Orleans had sandy, acid soils of low fertility – too low in fact to grow good crops of cotton and corn, but apparently quite to the liking of camellias. South and west the soils were more fertile and neutral to mildly acid in reaction; they too produced fine camellias. However, the soils in New Orleans were found to be both alkaline and poorly aerated, and, when these conditions were corrected by proper additions of organic matter, fertilizer and acid amendments, it was found that camellias would grow as well here as they would in the nearby regions. Thus it helped prove that, wherever climate is not the limiting factor, camellias can be made to grow well simply by amending the soil to meet their normal growth requirements. It was also shown that soil treatment can be overdone and that the continued use of soil amendments, far from being beneficial, may eventually create a soil condition even less favorable to the growth of the plant than that which prevailed before treatments began. The excessive use of acidifying amendments, for example, releases toxic elements such as manganese and aluminum and accelerates the leaching of magnesium and calcium. Thus in an overly acid soil a in may be poisoned and starved and m that way become an easy victim of the effects of high and low temperatures and of insect pests and diseases. On the other hand, a plant may be fed too well. Excessive feeding may cause a camellia to become unduly vegetative and less resistant to weather extremes and to certain insects and disease. Camellias which are slowly grown in favorable soil are better able to withstand the variations of their environment than are soft, overfed ones.